New Season Party for Slots lovers! Green is the color for this weekend along with pots of gold, rainbows, lucky four leaf clovers and lots and lots of GREEN CASH. 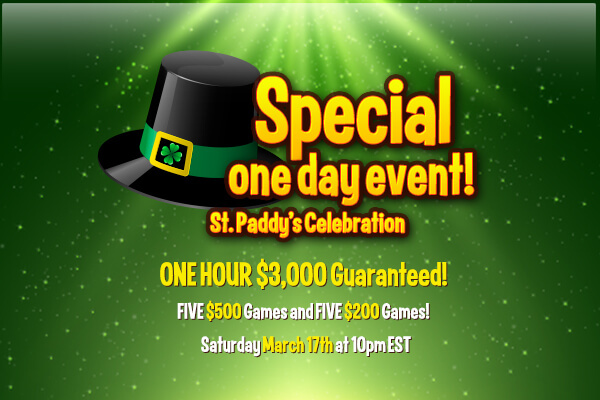 This Saturday March 17th at 10PM EST find your pot of gold in the Fair and Square Tourney Room special edition, where we will be giving away over $3,000 in Guaranteed prizes. (Five $500 games and Five $200 games) - Simply register with $25 cash and you are in it to win it – DEPOSIT AND REGISTER to unlock this room. Then find your own stroke of good fortune this St. Patrick's Day Weekend, bingo on the RAINBOW GAME carrying MAGICAL GUARANTEED JACKPOTS $500-$100, $250-$75, $150-$50, $100-$25 and win thousands in cash, over $25,000 up for grabs! The game is played randomly in the main room from March 16th-18th. We've got lots of surprises in store for you! [Follow us on Facebook] to stay up-to-date with all of the latest bingo news for a little bit of EXTRA GOOD LUCK this month. Go on, get your share of Irish Luck this weekend and see how much you can win. Pre-buys available! CanadianDollarBingo.com is part of the well-established TheBingoAffiliates network and the only bingo site for Canadian bingo players that pays and plays in Canadian dollars. New members get a $50 FREE trial bonus and new depositors an incredible 1000% Welcome Bingo Bonus Deals. See you all in the bingo rooms! This entry was posted in Blog on Mar 15, 2018 by Canadian Dollar Bingo. © 2019 CANADIANDOLLARBINGO. All rights Reserved. You must be 18 years or older to play.